Penny and Fletcher – all finished at last! HomeUncategorizedPenny and Fletcher – all finished at last! I’ve pretty much dedicated my weekend to this quilt. Aside from housework, a jaunt to Morrisons, a nap, reading Giant George’s book, watching Snakes on a Plane again and cooking roast beef, this is what I’ve been doing. Saturday saw me finish the quilting after finally getting to grips with the free motion pre-flight checks I had to run on the machine, then Sunday morning was the painting and doubt stage (thank you to everyone who gave me feedback on the painting! ), by lunch time I had set the paint and by tea I had sewn on the binding, made the sleeve (using this tutorial) and sewn that on too. By bedtime the label was tacked to the back and the threads had been tidied up and lint rollered to remove real dog hairs. It’s being posted today! I would probably make another one. I say that- I actually quite liked the process and WANT to make another one, I’m not yet sure of the subject matter though. I’m planning on selling the pattern from the next one I do so it will take a bit of thought. Maybe a puffin from my photos last week? Or the vintage HMV dog (if I don’t sell the pattern), or maybe even a landscape. I’m really not sure yet but if you have any ideas of something other people might want to make too, you know where the comments box is! One month today and I will be seeing it on display at the Festival of Quilts! Are you going? Fabrics used: Mostly scraps from my box- I didn’t keep track of them all, but there is some Pezzy Print by American Jane, a scrap of my own fabric, some Meadow Friends by Deb Strain and a couple of grey fabrics from Ruby by Bonnie and Camille. Paint: Pebeo Setacolor in transparent black (with lightener), transparent tan and transparent dark sienna. Quilting: Machine quilted in thread painting style on dogs, bubbles on noses, squiggles (and name) on white and straight line on blue. Gutermann thread, mostly 414 but some dark grey, tan, dark brown, black and a varigated Aurifil at one point. 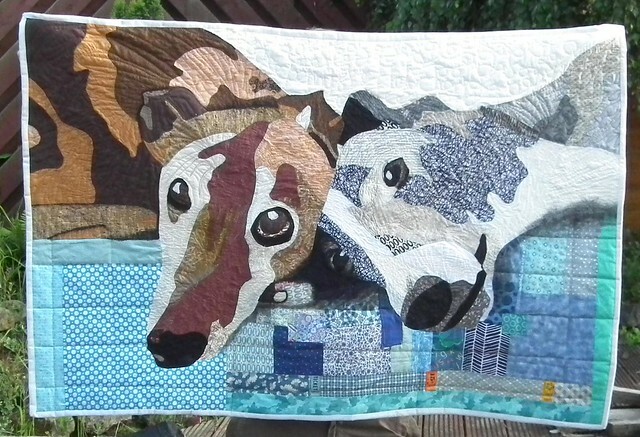 Want to enter a raffle to win your own custom pet quilt like this? Click HERE! 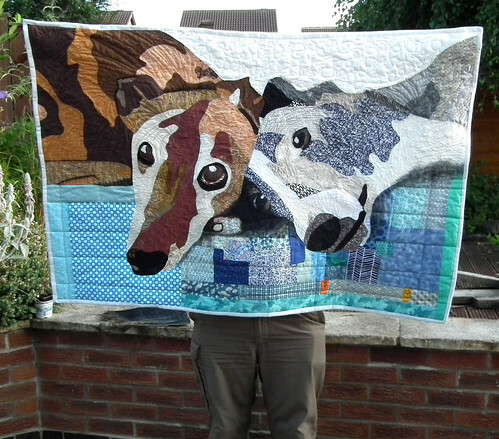 Did you get here from Lily Pad Quilting’s Pets on Quilt competition? Click here to go back! Previous post Your thoughts please? Absolutely gorgeous! I sure hope to see it in the Pets show, too! That is a totally fab piece !! I think you made great fabric choices for the doggie portraits. Such shining puppy eyes. Great job! That is beautiful! I think a puffin quilt would be a good idea, especially if you’re going to make a pattern to sell. This is lovely! I hope to make a quilt with faces of my yellow labs soon. Want to cherish their memory with cloth. What a fantastic art quilt! Well done!! So you painted the dogs? This quilt is fantastic, one day I’ll do an art quilt! No, just the shadows and a little bit around the eyes- the rest is needle turn applique 🙂 I’m starting another one now! Fabulous quilt. Love the expressions that you captured. Very well done. Was curious why you chose a monofilement thread for piecing? Nicely done in listing technique. Enjoy the show and thank you for sharing with us. You captured the personality of the pets in this quilt. Hope your quilt garners much attention at Festival. That is a terrific art quilt. You’re very talented. Wow! Great job. You are more patient than I. How beautiful and your shadowing is fantastic! Thanks for sharing! What an amazing quilt. I could never attempt anything like that. Good luck at FoQ. You have managed to capture such wonderful detail in your beautiful quilt – just amazing! I´ll just saying, Wow- Beautiful ART! I have enjoyed watching this come together and the finish is totally awesome!! You deserve a standing ovation for this one!! This is wonderful. I love the way this looks so much like a photo with extra dimension. WOW! I am in awe! I hope that someday I can achieve this level of skill! Truly beautiful work! I’ve just come over from Lily Pad Quilting. I love your quilt of Penny and Fletcher. It is beautiful. I really love the quilt. Really beautiful work. I just love this quilt, great job! I would love to be able to do this one day. Very well done! Thanks for joining in the fun. Me is totally in awe! That is a fabulishious quilt!